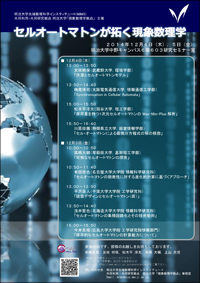 "Tokyo Symposium on Optical Illusion 2015"
Optical illusion is one of fundamental subjects in vision sciences, mainly because it triggers anomalous behaviors of the human vision systems and thus helps us to understand the vision systems. Various approaches are possible to the researches on optical illusion. Among them we will concentrate on psychological approaches and mathematical approaches, where the former places emphasis on experimental observation whereas the latter places emphasis on mathematical modeling of the vision process. In this symposium, we invite researchers from both sides and offer an opportunity to communicate each other for future study of optical illusion. 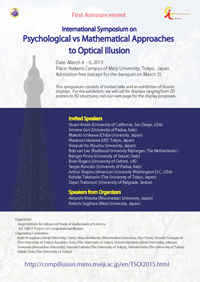 Also we call for demos on optical illusion that will be exhibited during the symposium. "Motion illusions as a tool to understand brain mechanisms in typical developing individuals and in clinical populations"
"Motion capture in terms of illusory motion signal obtained from oblique lines"
(UEC Museum of Communications; UEC Tokyo) "A model for explaining the anomalous motion illusion"
"Color-dependent motion illusions in stationary images: What causes illusory motion?" "What is shape? New phenomena in the light of a new approach"
"The concept of illusion and a new classification"
"The dual role of perceptual boundaries as unifiers and dividers"
"Illusions generated by conflicts between color, color contrast, spatial scale and position." "Being a (visual) illusionist: works and a future"
"A computational model of luminance contrast orientation illusions"